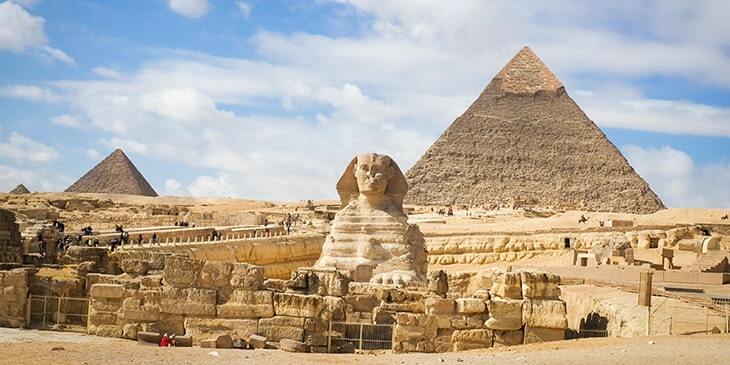 Cairo is the world-famous epicentre of ancient civilizations, magnificent architectural wonders and diverse cultures. This Egyptian capital is a fascinating metropolis that boasts mesmerizing landmarks, world-class museums, colourful art galleries and religious monuments. The most recognizable landmark in Cairo is the Great Pyramid of Giza, dating back 4,500 years with various Egyptian royal kings’ tombs and sphinxes carved from single stone blocks. Another excellent tourist spot in Cairo is the 7th century Hanging Church, one of Egypt’s oldest churches which features incredible ceiling frescoes. The Cairo Citadel is another site worth visiting with magnificent arches and fortification layers. Then there’s Cairo Tower, one of Africa’s tallest buildings which was constructed in 1961 with colourful mosaics. You can also visit the 19th-century Ben Ezra Synagogue to discover beautiful floral motifs and Ottoman architecture. Finally, make sure you step inside the Al-Azhar Mosque, one of Egypt’s oldest mosques and explore its pointed minarets and enticing marble courtyard. Book cheap flights to Cairo from India through Brightsun Travel and look forward to admiring the grandeur sites in this immense city. Cairo is renowned for its rich Egyptian cultural heritage; there’s a plethora of captivating cultural sites to explore here. No Egypt tour is complete without visiting the Egyptian Museum which is home to the world’s biggest collection of ancient Egyptian artifacts; more than 100,000 objects are displayed here, including sculptures, pottery, stone coffins, jewellery and weapons. You can also discover the mummies of famous royal kings dating back 3000 years, including King Tutankhamen and Ramses II. Another superb cultural venue in Cairo is the Coptic Museum which boasts a range of 16,000 Christian antiquities, including 4th-century sculptures and the papyrus manuscript of the Psalms of David. Then there’s the Museum of Islamic Arts displaying one of the world’s largest collections of Islamic art, including rare illuminated Qurans, textiles and manuscripts. Another captivating venue in Cairo is the Al Masar Gallery located in the Behler’s Mansion, where you can admire a range of contemporary Egyptian art pieces. Brightsun Travel offers cheap air tickets to Cairo, allowing you to come and witness the city’s rich Egyptian cultures.